Corruption Journal: I am on a drug. 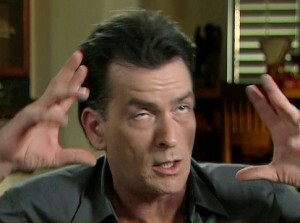 It’s called Charlie Sheen. Because this point won’t be made by the corrupt and rotten media (too truthy): Every country that’s tried austerity has had their economy get worse. The more harsh the austerity, the worse that country has fared. CNBC analysts blamed the market troubles on a European economy that looks like it’s going to fall off another cliff, and Europe is largely the poster child for the kind of austerity we just enacted. The few countries that practiced stimulus all fared better, with the United States near the top in spending and near the top in recovery metrics, really only trailing Germany because of a good export market. So naturally the GOP forced Congress to reverse course and enact serious austerity measures. Within 48 hours, the Dow crashed and a NYT/CBS News poll finds the the highest disapproval of Congress in history, at 82%. This, after GOP leader Speaker John Boehner bragged that his party got 98% of what it wanted from the debt ceiling deal. It’s gotten to the point where GOP corruption and extremism has become so commonplace and all-encompassing that covering it requires a big picture view to see it all. If the equally corrupt and rotten media covered even a fraction of the crimes and scandals perpetrated by Republicans and those that support them, we wouldn’t have a Republican Party in this country. It’d have been banned as an unprecedented criminal conspiracy unrivaled anywhere in the civilized world. On the days when I’m not writing original stories, I plan to collect the day’s bill of corruption, law breaking, and scandalous misdeeds of establishment Republicans and their allies in corporate America, in this, the Corruption Journal.